Club Penguin Cheats by Mimo777 Club Penguin Cheats by Mimo777: Club Penguin Series 4 Orange Puffles! Awesome! Check out the series 4 puffles that have not yet been released in the U.S. You can get these in the U.K. in April. I think they will be available at the end of the month in the U.S.
Do you see our cute buck toothed orange puffle? Note: Not all pictured puffles are from series 4, but a new series will be available soon. Click here to check out all Club Penguin toys! Maybe the orange puffle will be a scientist and his toys would be a chemistry set! Maybe we could even use him in the new EPF Game! Why does the orange puffle have a purple tounge? Maybe! There still needs to be a flaygnott color and a phoorlingtion color! As you can tell I made those up too. Good luck Soccerbro! You can do it! Maybe! I think it will be funny and goofy, like the green puffle. Oh, and don't put (CPG Mod) unless you are Modding! Thank you! It's in the UK for once! !WOO HOO!! It's about time to! I really want one, it would be my first CP toy except the game! I don't know. Purple is an awesome color, and I guess it was just random! eveanpriestess said... why dose the orange puffle have a puple toung? All puffles have weird toungs! The Orange puffle has a purple tounge because the tounges of the rest of the puffles are the color of another puffle. Unless the puffle has their teeth showing, you can tell. Hope I helped! SWEET!!! i am in the UK now and will hopefully be getting one tomorow!! Ok! I hope I can make it! Which famous penguin would you want to meet the most? Remember, only one vote per penguin, and this is now through Friday! You got that right! And so far the orange puffle is the awesomest because purple is my fave color! And its cute buck-toothed smile :B Like me! the new puffles look awesome! also I think that the new orange puffle is gonna be kinda wacky, wierd, and cray!!! I'm trying to become a mod too! One tip for you: Never put (CPG MOD) next to your name unless you are answering a comment! Comment often and be helpful and you will be on in no time! Good luck on finding one! I bet they styled the orange puffle's personality after yours mimo! Hey mimo!I wonder what the orange puffle`s talent is going to be. That would be awesome! Great idea spycomic! why dose the orange puffle have a puple toung? Each puffle's tongue is the color of another puffle. I'll try to make it! I might not be able to though. But still, I'll try! I have the same purple puffle, same face and I got it 2 months ago! How is this possible? I live in the USA! Cool ill be sure to try and come. okay good luck, what's the capital of Louisiana? how many people are in Michigan? how much percent of Canada is inhabited? whats the most endangered species? what is the world record for most world records? what is my middle name? do you like pancakes? what type of green is your favorite? what is the average height of an adult emperor penguin? who is the worlds leading pie maker? who is the 34th president? who is the chairman of Microsoft? do you love CP? i won't but what 11AM? club penguin time? Why do humans have a pink tongue? There is a glitch! If you play an instrument in the lighthouse, you can't hear it! The orange puffle looks like Albert Einstein, or a mad scientist, doing its laugh. You know like,"IT'S ALIVE!! IT'S ALIVE!!!!! MWAHAHAHAHAHAHAHAHAHAHAHA!!!" Or probably it is just hyper because it ate too much candy. Or it is just CRAZY like me in school with my friends. I like to make them laugh so hard!!!! :-D!!!!!! hi. Because Mimo has a lot more fans else where in the world. It's not that he doesn't like Ireland it's just that he has more fans else where. It's cool to hear that your from Ireland. The capital of Louisiana is Baton Rouge. Around 10 million people live in Michigan. I have no clue now many people live in Canada! The Siberian Tiger is the most endangered species. I don't know who holds that weird world record! I don't know your middle name, I love pancakes, I love neon green the most, the emperor penguin is about 48 in. tall, I love pie but i don't know who is the leading baker of pie, Dwight E. Eisenhower was the 34th president, I don't know who the chairman of Microsoft is, and I love CP! That has actually been here for a while. Thanks though! Back in 2007, my friend and me came up with an idea for an orange puffle. Our idea was so cool that he sent his idea to Club Penguin. He figured that maybe he could be a scientist, and I thought that he would tie in to a CP Mission! Herbert would turn the Ski hill into a volcano, which would threaten to melt all of Club Penguin. Then, the Orange Puffle would fly in and plug it up with a giant cork. Also, how do you mod? I am not a mod already, but a Mod-in-training. The way you mod anyway is by answering questions that people comment. I think you and your friend have a great theory! Ummmm, long answer, there Ninja! You sort of went over the edge there, and he wanted one question, and a topic related to this post! So don't do that, it has the mods confused. Thanks! That's a good idea! You mod by answering questions that come up in blogs. After your name, you put (CPG mod) and eventually Mimo will make you one! That sounds kool. You mod like this! Read through the comments and if you see a question, like yours, copy and paste the comment, make a line, and write your answer. Then sigh your name and (CPG Mod). Paul Salhi holds the most world records. The chairman of microsoft is Bill Gates (thanks dad). Thats an awesome idea! You can Mod by answering peoples questions, and putting Your name and CPG MOD at the end of each answer! Good luck and hope to see you on the Mod list soon! WOW... you just named more colors than a box of crayola crayons could lol. That would be cool but I have a feeling clubpenguin will only release one new puffle a year. 4. Make sure your answers are correct and informative, make sure they arent too long. In April it should be coming out so keep your eyes peeled! This is for all the people asking why the orange puffle has a purple tongue. I think that the puffle is warped. (Not as woarped as mimo, hes still number 1! (; ) Look at its expression and the pics mimo has. LOL right. Anyway, you dont have to go with what i say. Im sure CP will reveal it soon enough. does anyone know when they come out in canada? We've already discovered them! hiding in boxes and making coo coo clock noises Xp lol jk jk. It appears to be silly, but may be it is a good hider. Lol, good idea! You Mod like this: If you see a question someone answers in the comments, copy and paste their comment into the comment box, seperate their comment with your response, (~~~, ---, etc.) and then just put (CPG Mod) next to your name! Did I help? Pretty good theory! No one can be as warped as Mimo, though! Not even me and I am pretty darn close! But, I am pretty sure the purple tongue is just random...Also like Mimo! Hey fluffygood i wanna be your buddy really bad so can you meet me at Ice Shelf on the 16th at 2:00 CP Time in the Ice Rink? Mimo, when and where do you usually go on CP? Sorry but Mimo can only add you if you are a Mimo mod or won a contest. I don't know, because I don't live in Canada. But, this is probably wrong, I think that they will come out around the same time as they do in the U.S.! I have a few ideas! Goodbye penguins of the world! Peace, love, war, penguins! This is bTiMe6 signing off! And last but not least, Say good night penguin! Good night penguin! Mimo said in his post that some of the stuffed puffles in the picture were not new. His favorite servers used to be on the sidebar (one of them was fjord) I don't know if they are still there. Also, He goes on during parties, and every wedsday and thursday night he's up late on Clubpenguin taking pictures for clubpenguingang. If your lucky you can find him. Good luck and happy Mimo hunting! ew... their faces are weird. i like the green puffle and the orange puffle the best. anyway gotta rund! i wanna go play plants vs. zombies! Cool Beans! But the orange is a little weird. actually search clubpenguin and you will see a bunch of different colored boxes, probably the colors of the puffles in that room. I was considering getting that app but i don't know.. should I get it? Is it fun? Bio: A wild little guy, probably the ultimate red puffle! SO COOL SO COOL SO COOL SO COOL SO COOOOLL!!!! I LOVE THE WHITE PUFFLE!!!!!! Also my username is Koopatroopa2 on club penguin, Remember that now, Mimo777!! They are already out in UK, I saw white one in disney store! What are puffles? how do ya get 'em? Club Penguin just has it this way! all the puffles have individual colored tongues! Awsome! don't forget colour Jicknuay. Lol look at the orange puffle its the only puffle that is really tickled pink, hey i notice too i think everytime we had a puffle party a puffle come out.... hehehe i hope soon there will have a robot puffle that herbert will make and i hope too that the puffle wrobot will be on the pet catalouge but i hope too that make more puffle for non-members. i hope there will be a costume in the puffles like hats etc. and i hope too that soon will have a trading system hehehe, if billybob will make a choose a color of new puffle silver bronze gold or a characteristic of a puffle like robot puffle invisible puffle ghosst puffle etc. etc. please billybob make some clothes for non members. I think that the orane puffle will be MUCHO LOCO AY AY AY! Hehehehe. There have been Club Penguin toys in the UK before because I have four penguins (a fire fighter, Gamma Gal, a ballet dancer and Candace) and I live in Scotland, UK. You should name the orange puffle after you! LOL! Or, I guess CP is such a big fan that the puffle is supposted to be like u. That's a pretty cool idea, Thadeus! the whole secret agent incorporation into your idea would be really cool. I agree that they should make puffles for non members, then we wouldn't have to go and buy puffle plushes just for the coin code. AWESOME! I remember it took FOREVER for the white puffle to come out as a plush! The day it came out i was like, I wonder if they have the white puffle plush out yet. Finally they are launching it really quickly! It is easy to figure out the next color puffles... if u r an actual detective or agent! This clubpenguin mythbusters video is rreally good. I think hes an actual detective. It has such good reasonings on any myth. Like tipping the iceberg, the giant squid, and the new puffle clues. The next color puffle after this is brown and then its a hot pink. 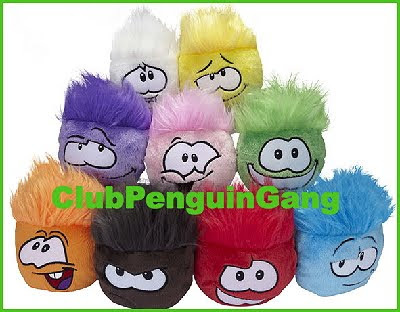 They should have puffle hairstyles. I designed a few. The Pony is a side pony tail. The Ed is really spiky hair. The Sk8r is a little bit of hair in front of the face of the puffle. The Rocker is a fohawk. And i forget the rest i made up. That would be awesome! although in the catalog it will probably jst called Orange Puffle, you can buy one and Name it Mimo Jr. :) You're right though, it is alot like mimo! TURTLES! oh ya and Penguins. To bad he wasnt the yellow puffle Id cam him Spongebob!